Click here to see a full size sample screen shot.. This is designed to be simple. 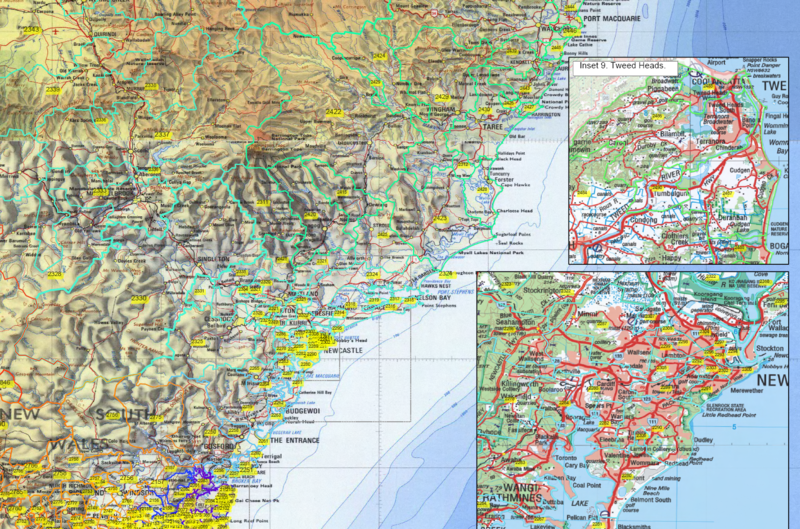 Commence with the low resolution version of your map. This is a relatively small file which will display quickly on most modern devices. Open the file either by double clicking, or using your Readers’ File/open menu. It should look similar to this showing the full extent of your map. 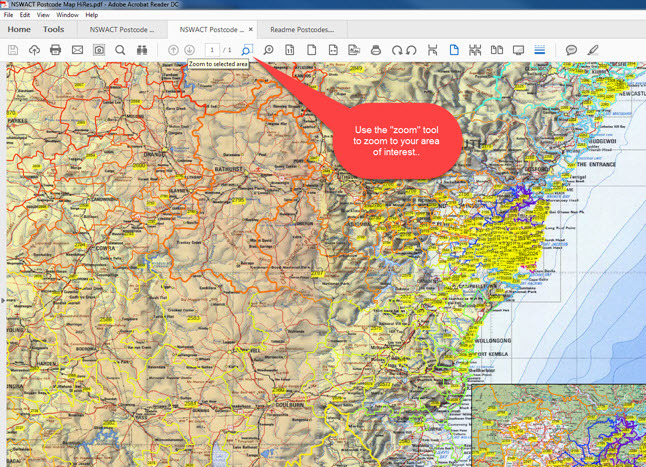 Once you are ready to start searching for Postcodes, it is a good idea to zoom in to a smaller area using the zoom tool illustrated. You will see greater detail.. This will open a special area in your Reader in which you can enter the value of the postcode or locality you are interested in. In this example a postcode “2340” has been entered. Next click the “search” button.. 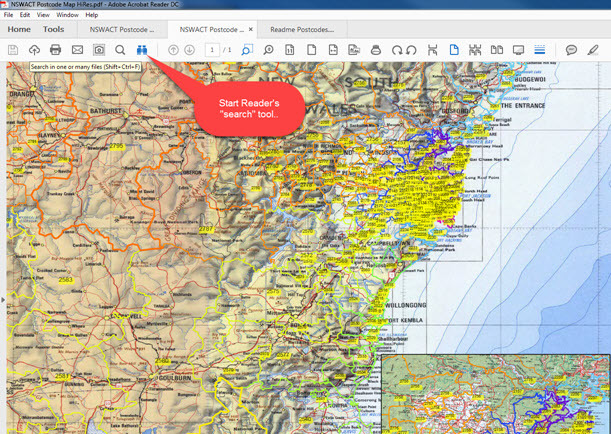 If the search item was not within the map view when you hit search, your map will automatically be adjusted so that the postcode or place you have searched for, is in the centre of the map displayed. 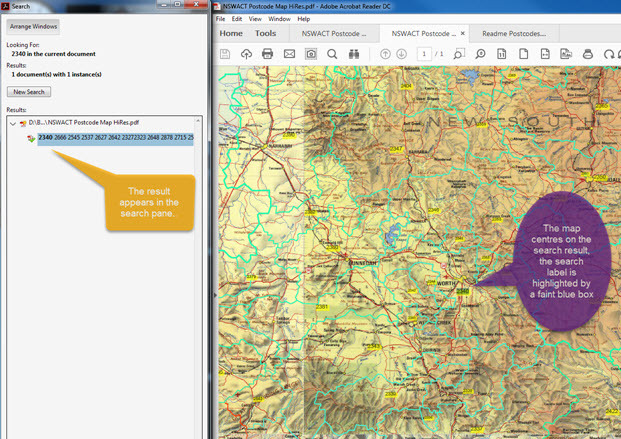 Zoom in or move around to reveal the details you are looking for..
You can also search for town and other locality names in the same way. Zoom in or move around to as needed.. 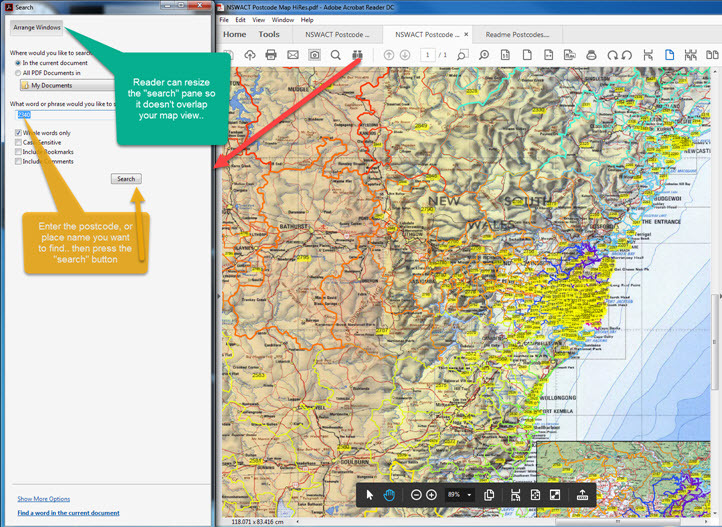 In some cases your postcode of interest will be present in more than one location on the main map or inset maps. When your search finds such an instance, the list will include an entry for each occurrence. By clicking on each, they will be highlighted on the map. Here we have searched for “2652”. There are quite a few separate areas for this postcode around Wagga Wagga in the Riverina of New South Wales. 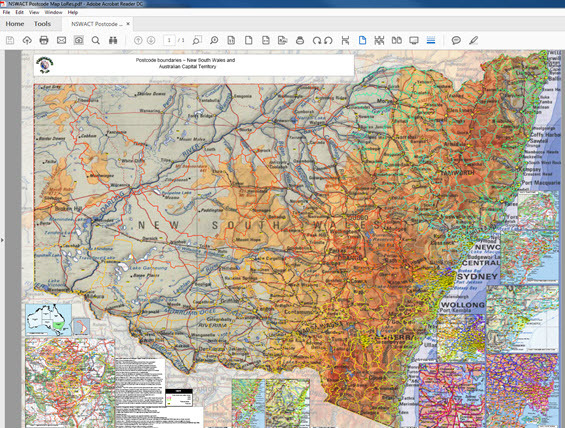 Your view may move to a different level of detail on one or more inset maps. 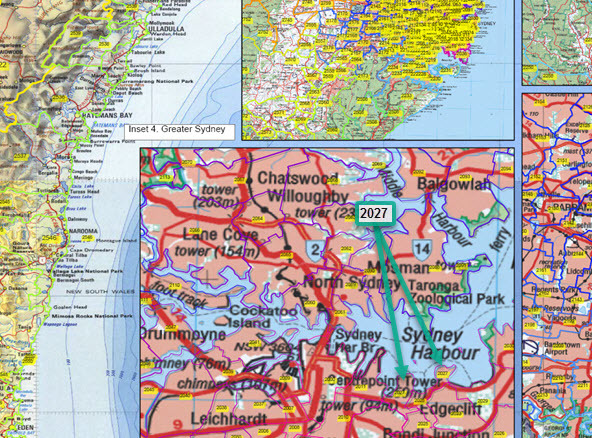 Here there are two distinct areas for postcode 2027, separated by Darling Harbour and postcode 2028. Towns and suburbs appear as a default highlighted Reader “block” rather than actual names; this is to maintain map legibility. 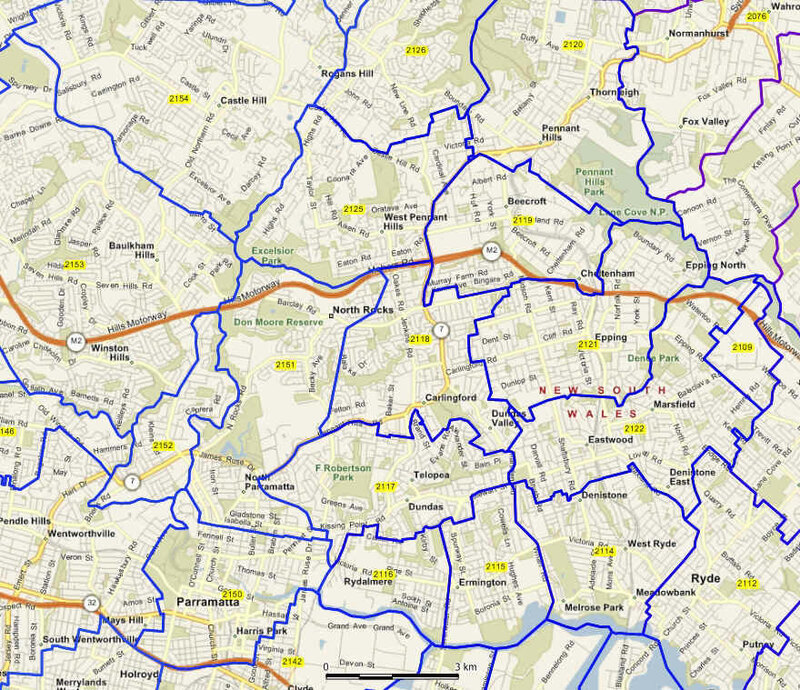 In metropolitan areas, the detail of our postcode areas can be seen in the image to right. 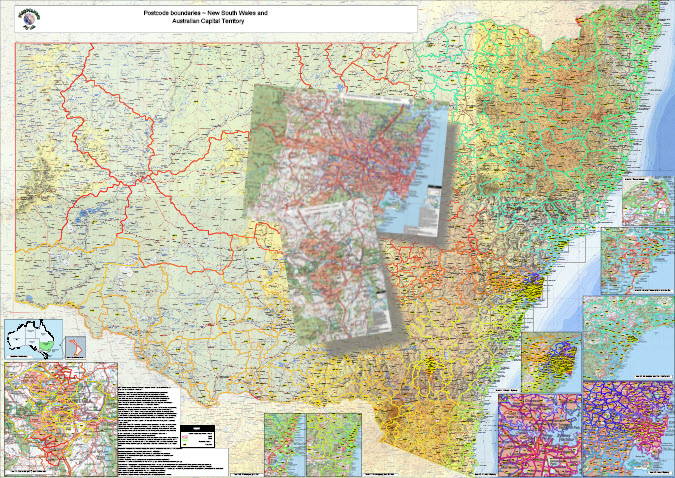 The area shown is part of the PC002NSWACTDAT product and is an area approximately 15 x 15 kilometres, to the north and east of Parramatta. 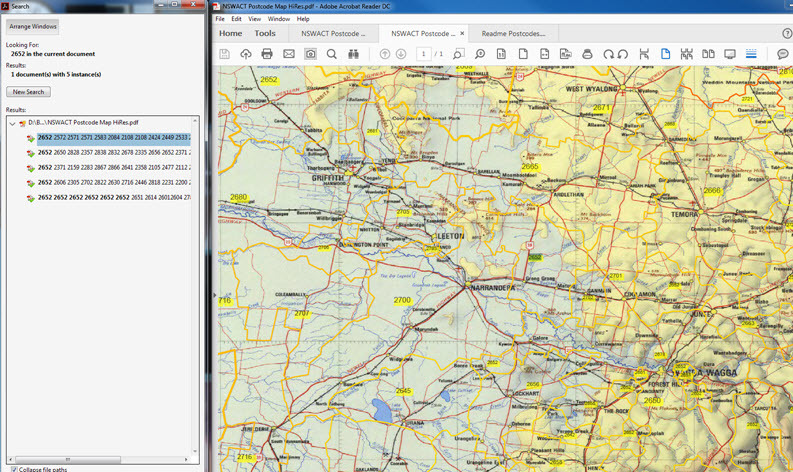 You can upgrade from your Map Series product to the equivalent GIS product very economically, should your postcode information needs become more advanced. The background image is an “OpenStreet” image.